I have a strong love for these pants. They're similar to the pants I wore here and I swear those pants are the best thing ever. Since I received this pair, I've been trying hard to avoid grabbing them each and every morning. It's so easy to dress them with sneakers and a t-shirt but I decided to avert the comfort route and wore a pair of heels. I've clearly been changing in size and weight so I've opted to wear a lot of flats and sneakers lately. Let me just say that wearing heels ain't what it used to be. I can totally relate and actually I learned after getting sciatica during my last pregnancy that wearing heels is NOT worth the pain it can cause in pregnancy. Worst pain ever!!! But you look amazing! 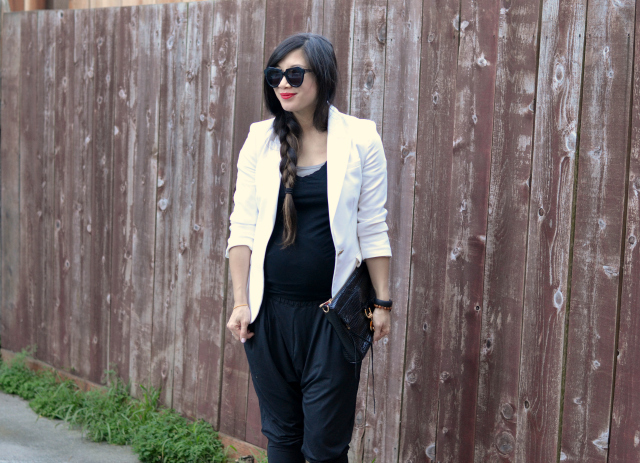 Track pants became a thing early in my last pregnancy. I bought five pairs and it was one of the best decisions I ever made. I wore a variation of them almost every day. Love the pants! They are so stylish but also perfect for pregnancy. I love how you added the white blazer and colorful shoes. Such a great look! 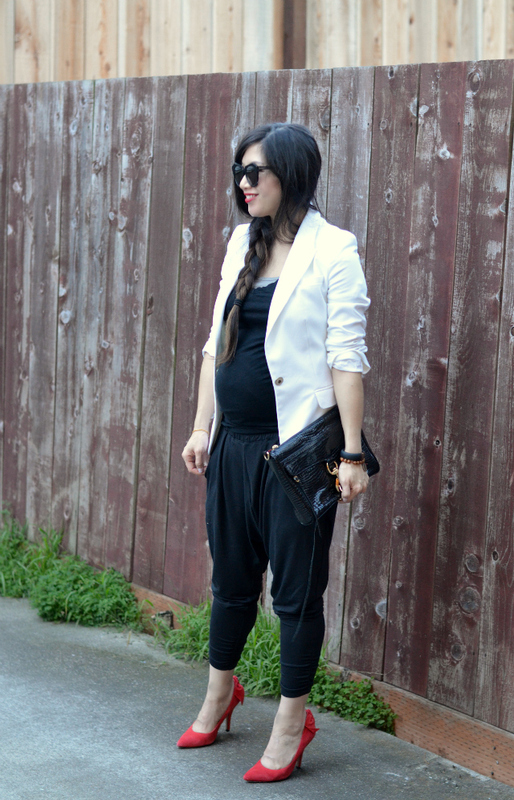 Those pants are so amazing and so perfect for a maternity look! Love the black and white with the red! So pretty! I need to get a pair of harem pants stat, you just sold me on them! You look great! Love your blazer! 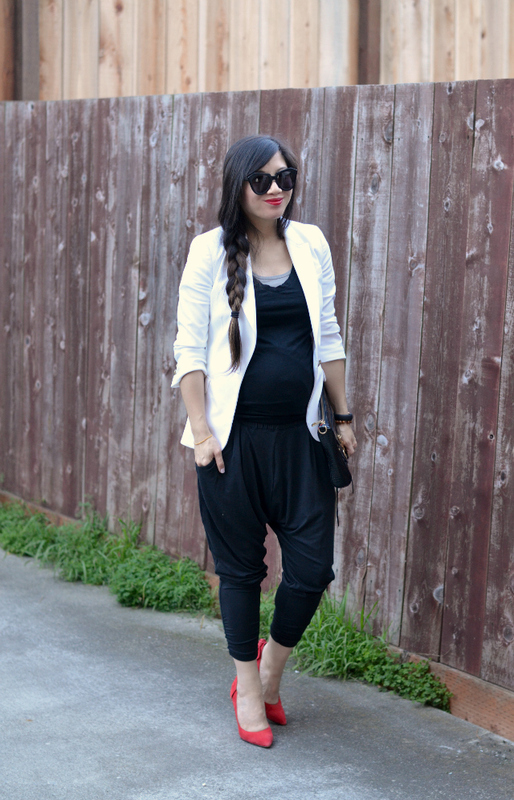 I absolutely love how you have been styling your bump!! You look great and this outfit is the perfect mix of comfy and chic! You look so smart and chic! Those pants are great...comfortable but cool! wow! paired with those red shoes looks stunning! 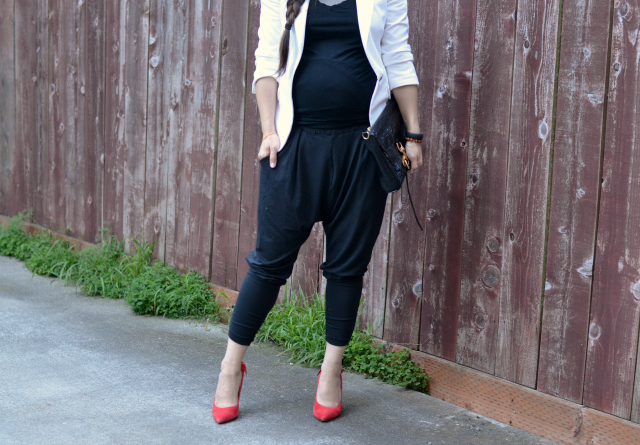 i have linen pair of harem pants and they are my absolute favorite to wear during the warm months! You are looking so amazing!!! I love these pants! Honestly, kudos for wearing heels whilst pregnant because I don't even wear them at all. You look totally gorgeous; your hair is so long & pretty. I've yet to buy harem pants but the look is quite cool. So cute! I love the whole outfit - the shoes are the best part! Bummer for not being able to wear heels, these are gorgeous. My feet grew a 1/2 size from my pregnancy and I wore heels till the end. I remember I had a function that I attended and wore a pair of ankle strap heels that I could not buckle and my hubby had to do it for me. You always look so chic with any height of shoes you wear. You looks so cute! I love joggers, and those shoes are incredible! 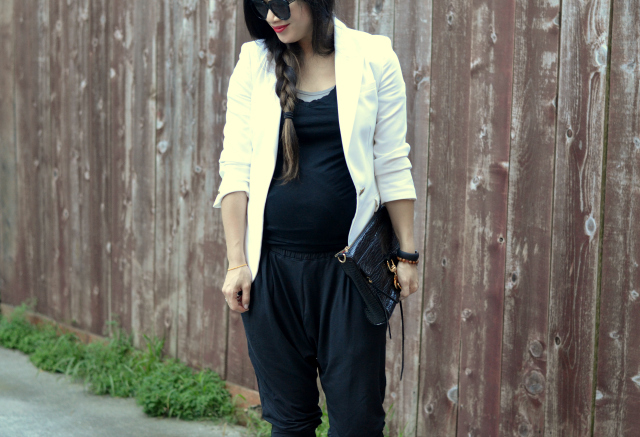 I think you are the most stylish pregnant lady I have ever seen! but take them off right now! No backaches for you! What a cool, feminine, casual chic look with a touch of edgy! Happy weekend! I like how the red heels stand out in this look. I also like your KW sunglasses. You are slaying pregnancy fashion babe! You look so classy and chic, especially with that lovely blazer.